(NewsUSA) - School's out for the summer, which means family fun time and hungry kids home all day. From camp lunches to days by the pool -- and all of those lazy days in between -- kids have one thing on their minds: snacks. To assemble the perfect snack and keep kids satisfied and smiling throughout the warmer months, follow this simple guide. * Involve Kids in the Kitchen: All those years of cooking for the kids will soon come to an end when you enlist them as mini-master sous chefs. Whether your kids are two or 10, they'll love learning and creating their own concoctions. Fruit skewers made from fresh fruit and toothpicks or straws make for the perfect teaching opportunity. Have your kids rinse strawberries, grapes and any other desired fruit, and slide them onto a colorful straw. For a frozen treat to beat the summer heat, pop them in the freezer for a few minutes before watching your kids enjoy their own creative snack creations. * Colorful Creations: Hungry kids are grumpy kids, and grumpy kids tend to be unhappy. The best way to keep your kids happy is to feed them well. A proper snack time means an array of options, and something for everyone. By presenting snacks in a creative way, kids will get to choose what they want to eat, providing an increased sense of individuality. Try separating dry snacks from fruit and veggie bites to present a colorful spread. 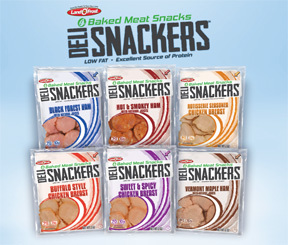 If you're looking to add that mid-day protein boost for a sluggish kid, a great healthy option is Deli Snackers from Land O'Frost, a baked meat snack made from high-quality, oven-roasted meats. This convenient and flavorful choice offers more than 10 grams of nourishing protein per serving with less than 400 mg of sodium, making it the perfect treat to pair with crackers and cheese cubes to appeal to the pickiest eater. * Tasty Twist: Instead of those sugar-loaded popsicles that often spark temper tantrums after the inevitable sugar crash, consider making DIY popsicles. These frozen treats will eliminate the added sugar, while still providing the juicy, refreshing dessert your kids crave. Pop your favorite juice and fruit mixture into a blender, freeze until solid and serve to the kids guilt-free. With these simple tricks in mind, grab the kids and get ready for a summer filled with simple snacking. For coupons and more information about Land O'Frost, visit www.landofrost.com.